BetOnline is the number 1 real money poker app for players who live in the United States. 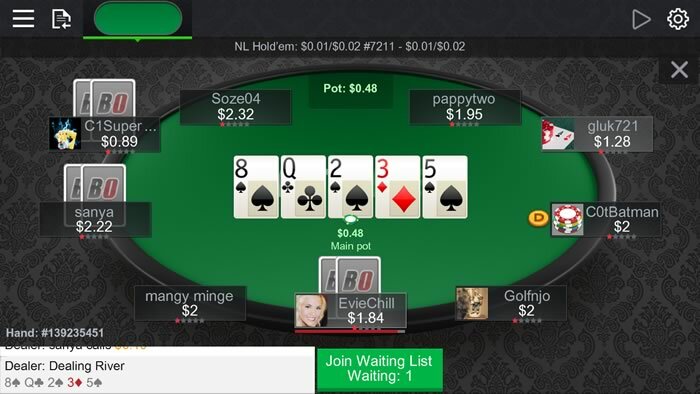 The BetOnline iPad, iPhone and Android app lets you compete in tournaments or simply play a few hands of casual Hold'em on your smartphone or tablet. BetOnline Poker works on the iPad, iPhone & Droid. Welcome players from ANYWHERE in the world. Mobile Omaha and Texas Hold'em ring games. Busy Sit N Go and Multi-Table Tournaments schedule. Play instantly on any tablet in the United States. BetOnline accept BTC and traditional deposit methods. If you’re playing from outside the US, then there is no shortage of quality mobile poker apps to choose from. 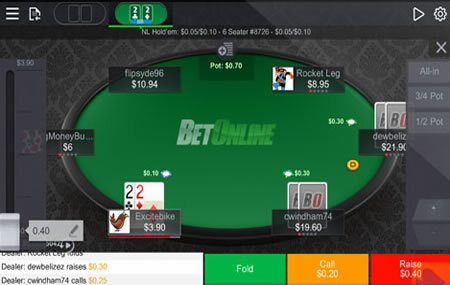 All the major online poker rooms have their own mobile app, and there are some which cater solely to the mobile market. We’ve spent a fair bit of time with the BetOnline Poker mobile app, and what we’ve found is a well-built and fun mobile poker app that holds its own against the competition. Installation is easy and only takes a moment: just go to BetOnline’s website on your mobile browser and you’ll find a link to download it. If you are using an Apple device, you’ll be pleased to hear that you can play from your browser with no download required. If, like us, you are using an Android device, you’ll have to download the app. On the bright side, the app leaves such a small footprint that you may as well be playing from your browser. Depositing and withdrawing is quick, both in terms of navigating the cashier and transfer times, and Bitcoin is accepted. If you do encounter any money troubles, BetOnline is a reputable company with a dependable customer support network, so your issue should be resolved quickly. A 100% bonus on your first deposit is available using the code NEWBOL. BetOnline Poker also offers a six figure Bad Beat Jackpot to be split amongst the table if quads jacks or better is shown down and loses. As well as this, the site also features the usual tier-based loyalty program. The table interface is very pleasant to use. 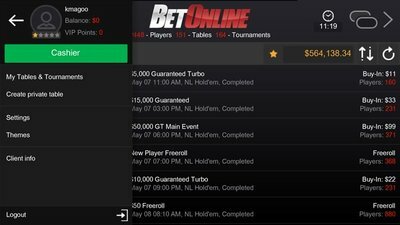 It feels similar to PokerStars and iPoker’s interface, which is certainly a good thing. The cards are legible and the buttons easy to press. The theme customisation options are somewhat limited, but this should not be too much of a problem as the default theme is very agreeable, with a simple modern design. Hand turnover is faster than most mobile apps, with very little lag or visible network problems. 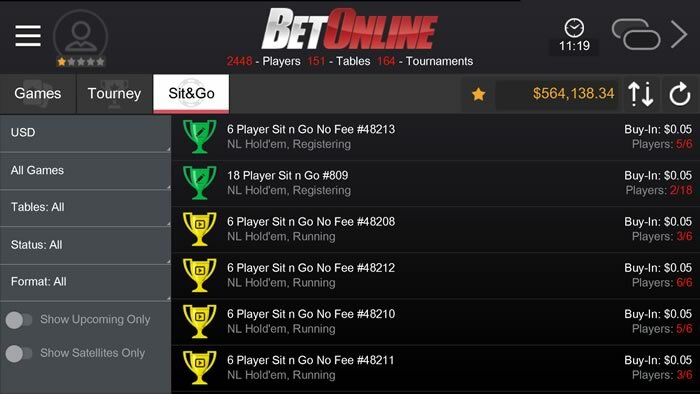 The lobby is serviceable, using the same list format as most other poker sites. ​The app offers cash games, tournaments and Sit ‘N’ Gos. The game selection is fairly modest: No Limit Hold’em is the only offering for tournaments and Sit ‘N’ Gos, whilst cash games also offer Pot-limit Omaha and Pot-limit Omaha Hi-Lo. A wide variety of stakes are available: cash starts from 1c/2c and tourney and Sit ‘N’ Go’s from under a dollar. 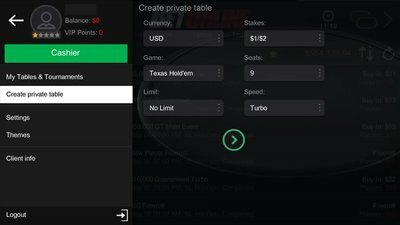 The high stakes action is meagre compared to other, larger poker sites, but you won’t struggle finding small to medium stakes cash games or a tournament with a $50+ buyin. Cash games see consistent traffic, and tournaments with larger guarantees often attract player fields in the thousands. That said, it is lower than what you may see at larger online poker rooms. What is appealing about BetOnline is that the player pool appears to be very soft; the general skill level is about what you would expect from a live casino, which is rare in online poker. Players will regularly call off with subpar holdings and take nonsensical lines. The average number of players seeing a flop is much higher than at other sites, as is the average pot size in big blinds. ABC poker or nut-peddling can get you quite far here. This may be because BetOnline Poker attracts gamblers who have come from the BetOnline sportsbook. Regardless, if profitability is important to you then BetOnline Poker seems to be a great place to play. 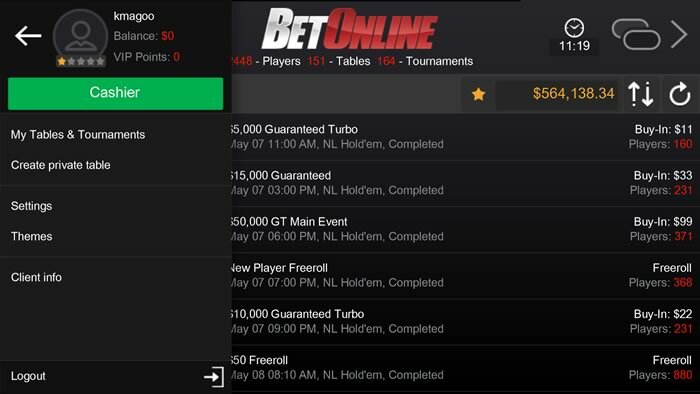 All in all, BetOnline Poker for mobile is a very well-rounded mobile poker app. The UI is particularly good, with intuitive controls and a glossy design. Depositing and withdrawing is fast and hassle-free. While it may not see the most traffic of all the mobile poker apps, it still attracts enough players so that you won’t be waiting long for a game, and most of those players are fairly weak. If you’re not too attached to your current mobile poker app, or have not yet got one, we highly recommend giving this one a go.